I have a friend who is really annoying. He doesn’t like food. It’s amazing we’re friends actually, but somehow we’ve persisted in hanging out for four years or so. He is a stick, who might not eat for a couple of days. I, on the other hand, might not eat for a couple of hours. He calls me Pig; I call him Sparrow. And this is how I’ve ended up dining at Byron Burger and Gourmet Burger Kitchen in Spitalfields. We arrived there fairly late on a weekday evening so I wasn’t expecting the place to be buzzing, but it somehow had a cheeriness that belied its emptiness. It was probably because our waitress was super-friendly without being overbearing and that always creates a relaxed ambience. There wasn’t any question about what I would order. 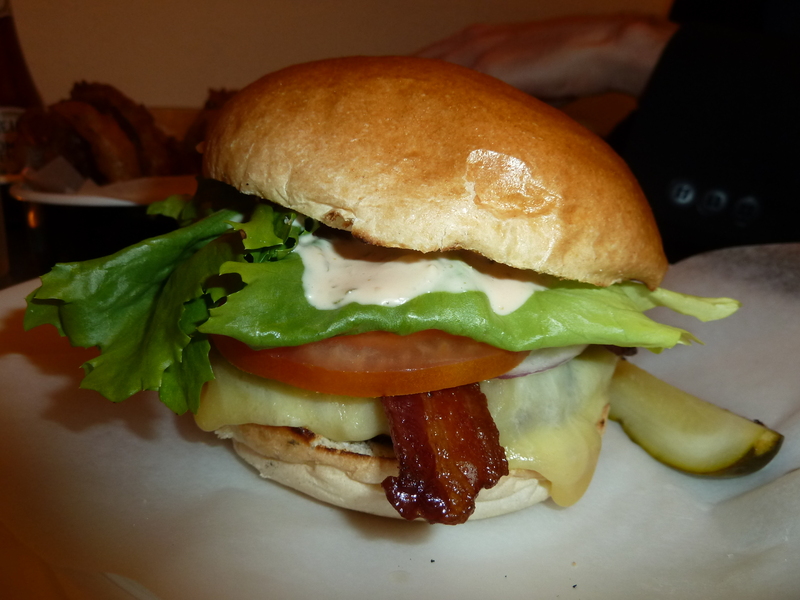 It was always going to be the Byron Burger (£9.25), which comes with cheese and bacon like all good hamburgers should. It was nicely presented, and the salad was very fresh. 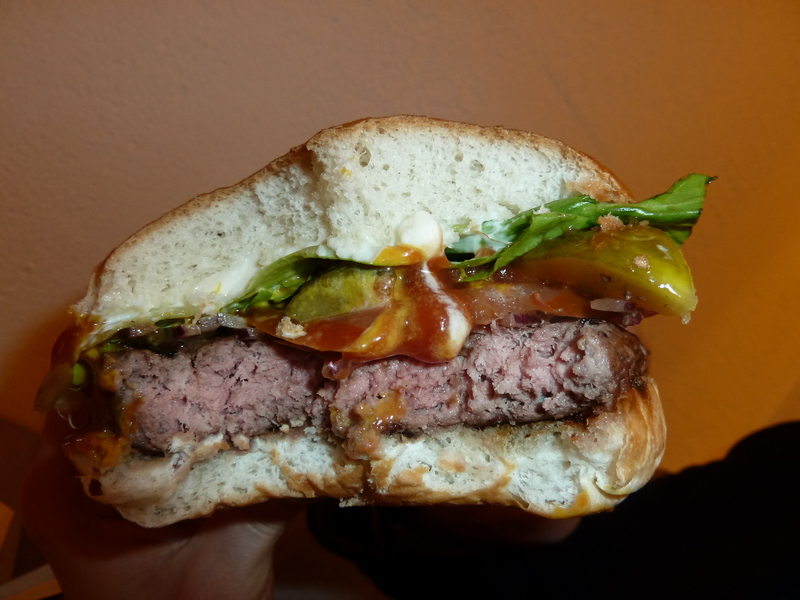 The burger was cooked still pink in the middle, which all burgers should be. 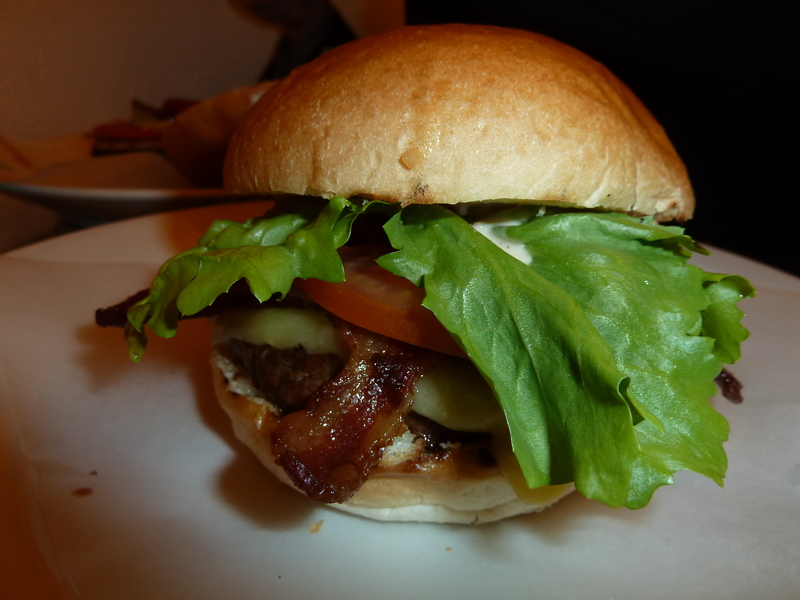 By itself, it was a little dry and not exactly bursting with beefy flavour. Still, with the appropriate relishes, it was enjoyable. However, I have no idea what the Byron sauce is – can’t say I detected it, although I presume it’s the white-looking sauce on top. 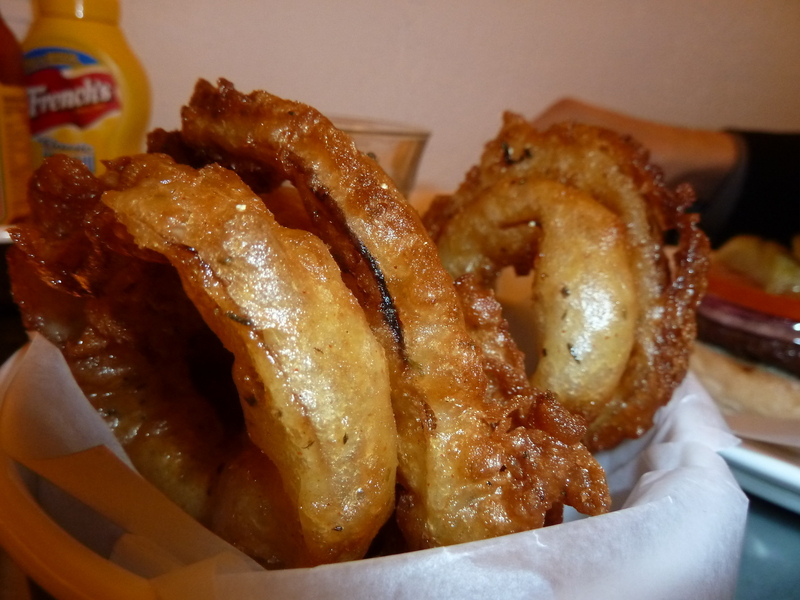 I took a side of onion rings (£2.95), which are some of my favourite things in life. The batter wasn’t the most well-seasoned in the world, but these were seriously comforting nonetheless. 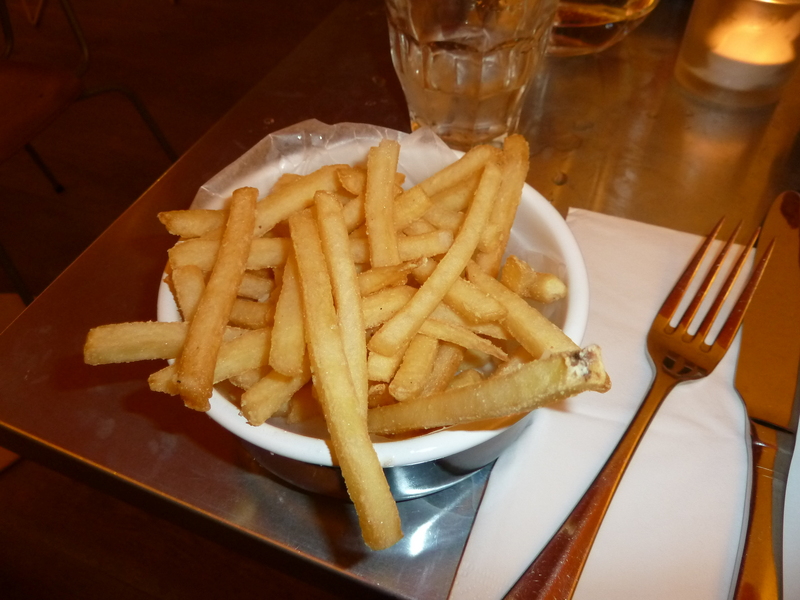 The chips were unremarkable (£2.95) – neither great nor terrible. Overall, they could do with putting a bit more effort into producing a more succulent and tasty burger, but Byron Spitalfields made for a quick but pleasant dining experience. In contrast, GBK was packed on a weekday evening. We squeezed onto a table and hurriedly made our order. With counter ordering and collect-yourself condiments, GBK is going for more of a fast-food feel than Byron. I don’t remember anything about the service so our food must have been developed without incident. 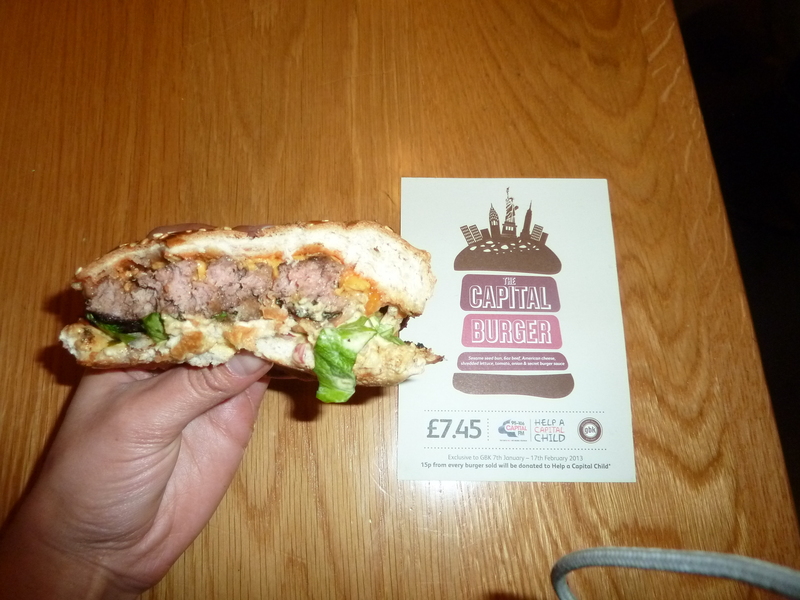 We were taking advantage of the Capital Burger promotion – two cheeseburgers for £10. The burgers arrived and looked… very sad indeed. And very far removed from “gourmet”. The bun was burnt. The burger was burnt. 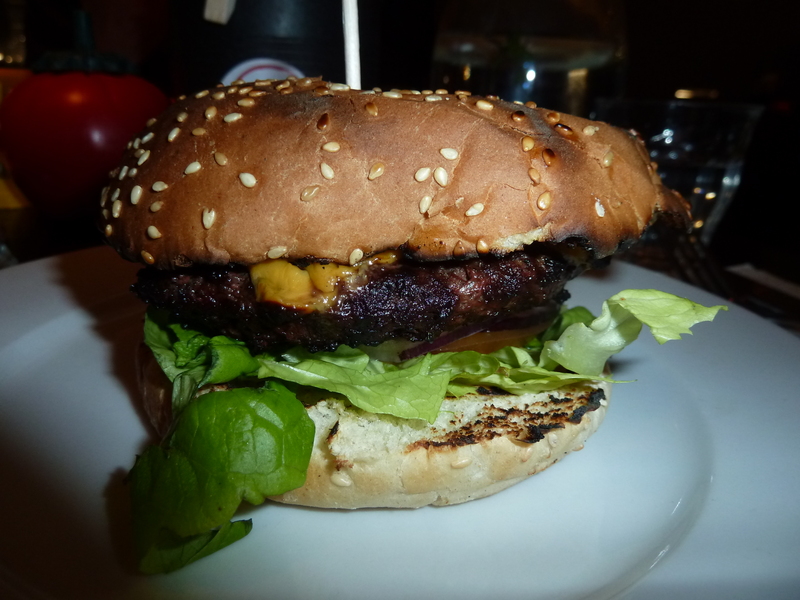 Inside, it wasn’t totally overcooked, but it suffered from being dry and lacking flavour, similar to the Byron burger. The difference is that Byron actually put some effort into the cooking, the other ingredients and the presentation. I ordered a small portion of fries for £1.50 as I wasn’t terrible hungry (I’d eaten before my friend had arrived so this was my second dinner!). These were just the right size and would have been good value if they hadn’t been akin to eating air. 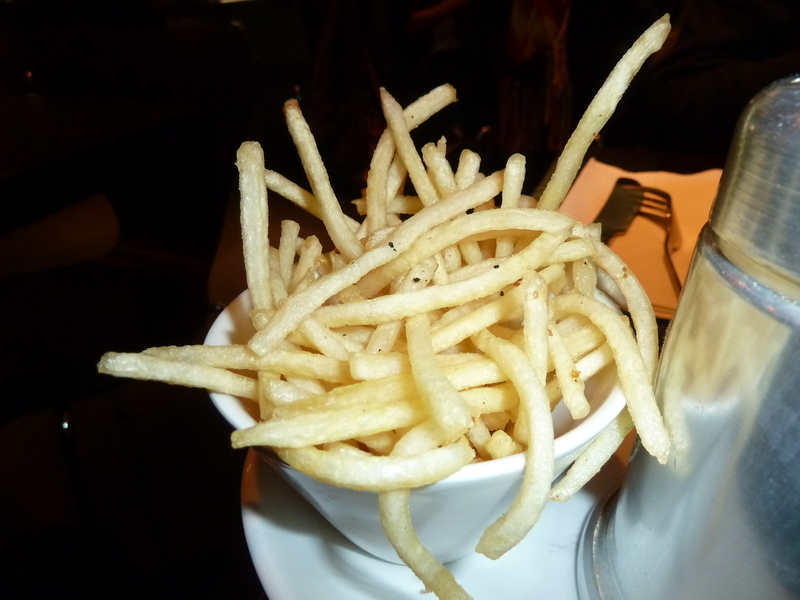 I found myself shovelling 6 into my mouth at one time to try and detect some kind of potatoey flavour. Alas, my efforts were in vain. 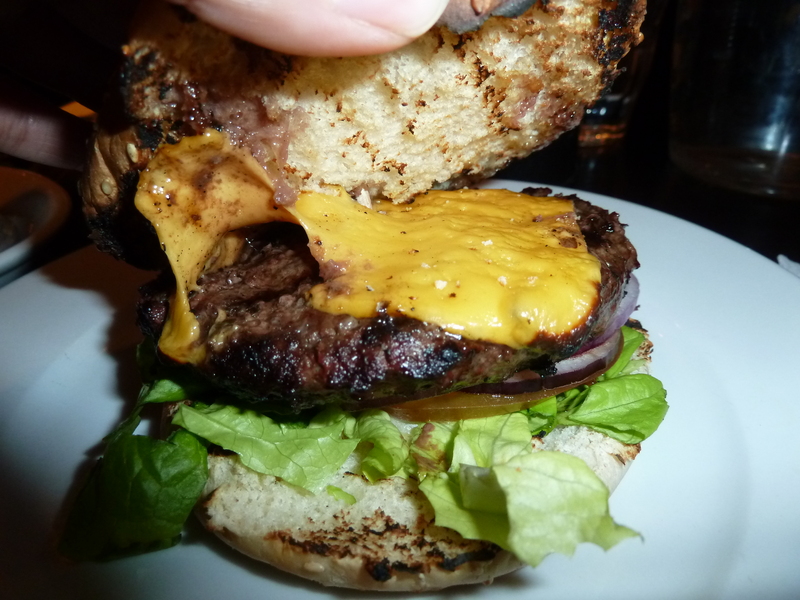 I have had a decent Taxidriver burger at GBK Soho, but Spitalfields was a poor show. The pictures speak for themselves. Byron beats GBK Spitalfields! Thanks for the review. Sadly it just reminds me how many places there are I want to go eat and not enough time to do it all! Well naturally all Byrons make superior burgers. It’s a fact! That’s LORD Byron… he totally stole my name and my gig by being born before me. Ha! The dining didn’t sound like much but I appreciated the “foreigner-celebrity syndrome”. Famous in the UK, and famous in China…. next stop, the world, right? Btw my friends had a great trip to Paris and loved the Dalí. And they told me that the food was good everywhere… I’m so jealous! I know this sounds weird but I like the way (slightly) burnt food tastes…crazy, I know, haha. And I’ll be looking forward to your next post! Haha only a little crazy! I do like some food when it has burnt edges – like burnt barbecue sauce…..
See, we all have our little interesting food preferences (; and yes, good move!